The Gospel–detective movie style! For more than 100 years, stories of Jesus have been the topic of movies. Many early works of cinema featured not only Jesus, but Moses, Sampson, David, etc, but this film is quite different in that it carries a much lighter tone than most faith-based productions. Sticking to the basics of what is known from the Bible and other Jewish and Roman historical accounts of the event, Risen lacks the pious and pretentious nature many of the films in this same sub-genre contain. Not quite cinematic per se or traditionally action-packed, the film has relatively slow pacing but keeps it interesting by supplying well-developed characters and simply the thrill of the original man-hunt. Although the message of the Gospel is clearly stated and shown in the movie, it does not come off as proselytizing. In many ways, the central character is an everyman because it is fairly easy to place yourself in his shoes–or sandals in this case–and imagine what it must have been like to have been in charge of guarding Christ’s tomb and then having to answer for the disappearance. One thing puzzles me; and that is Columbia Pictures’ timing of this release. Honestly, it makes more sense to have released it the weekend prior to Easter. Anyway, I digress. Risen is about the most famous and controversial man-hunt in the history of the world–and no, I’m talking Jimmy Hoffa–but for the Jesus of Nazareth. You may have heard the Gospel before, but not like this. 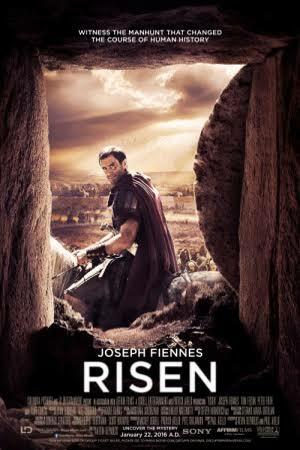 Follow Roman tribune Clavius (Joseph Fiennes) as he is personally commissioned by Pontius Pilate (Peter Firth) to supervise the burial and subsequent Roman guard of the famed tomb. Assisted by Lucius (Tom Felton), Clavius closely manages the burial of Jesus’ body and instructs the guards to keep watch to make sure the body is not stolen so Jesus’ disciples can claim resurrection. As we know from history, the tomb is discovered to have been blown open and thus begins Rome’s search for the body of Jesus in order to snuff out any uprising or violent radical upheaval. Clovis’ search for the body of the proclaimed messiah will force him to question his own beliefs as he encounters appearances and fervent faith that we cannot reconcile against the world he knows. A history and mystery in one! From either objective or subjective points of view, this is my pick for the best “Jesus” film ever. And yes, I am including the box office smash Passion of the Christ in that assessment. But what makes this particular movie more receptive and less controversial and other faith-based films in the past? Answer: lack of pretense. Whether talking God’s Not Dead or Passion of the Christ, both films do not attempt to appeal to a broad audience. They play on the court with the rest of the faith-based movies both good and bad. Risen plays to the audience differently because it concentrates on developing the realistic historic characters by pairing what is known by way of Biblical or Jewish/Roman historic texts with logical conclusions or using context clues to fill in the gaps. The writers did an excellent job in developing the character of Clavius as someone with whom many in the audience could identify because whether believers int he resurrection or not, we have all questioned our various and respective beliefs at one point or another and often look for answers very much in the same way a detective solves a mystery. Unlike other films where the focus is either directly or indirectly on Jesus, the focus of this film is primarily on the delicate political landscape between the Jews and Romans and of course our protagonist Clavius. However, this film uses the indirect approach to discover why Jesus’ was so special to his followers (and it still to this day). This indirect approach is far more effective for speeding the Gospel message than typical “Christian” films. Although this film is clearly about the mystery surrounding the resurrection of Jesus in the background, the foreground is a personal journey thus making it more of a historic film than a “Christian” one, so to speak. Therefore, most anyone who enjoys Roman or Jewish history will find something of interest in this film. The relationship between the Romans and Jewish leadership is handled very well. It shows the game the Romans had to play with the Jews in order to keep peace in Jerusalem–especially because Caesar is arriving soon and Pilate needs to show him that he has the Jews under control. The person of Jesus is also handled better than any other film I have seen. He comes off as an average Joe–that is, an average Joe who can heal lepers. But, he connects well with the audience and is very much down to earth in his appearance and mannerisms. Sometimes it’s hard to understand why his disciples then and followers to this day would choose to follow such a man, but this film makes it clear why. He embodies love. On a lighter note, I’ve always found it funny that in most historic/Biblical films, such as this one, most of the characters speak with a British or transatlantic accent. Pretty sure that was not the case back then. But, at the same time, it does not hinder the story in any way. Although the film is a little slow and the pacing isn’t always executed well, over all, it keeps in line with the traditional three-act plot structure and sufficiently supplies the audience with the proper turning points. Risen also handles character development very well. I really appreciate the development of not only Clavius but also Pilate and Lucius as well. To an extent, we also see some development in some of Jesus’ disciples as well. At the end of the movie, the characters in the story felt like real people, and that is a remarkable achievement in this movie. Ordinarily, we don’t see movies like this until Easter time. Even though we are a month out from it, I feel that if you enjoy Biblical or simply historic movies that are down-to-earth, written, acted, and developed well that you will enjoy this movie. Traditionally, I am not a fan of most faith-base movies because they are cheesy, pious, over the top, or just executed poorly; however, I very much enjoyed this film and hope you do too.